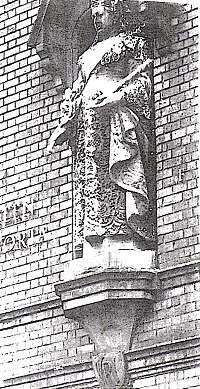 The statue in its original niche at the Royal Jubilee Schools. Sources differ as to the type of stone: some say portland stone, but surely this would have weathered more? The Queen's official 1897 Diamond Jubilee photograph, taken by Alexander Bassano, the leading high society portrait photographer in Victorian London. 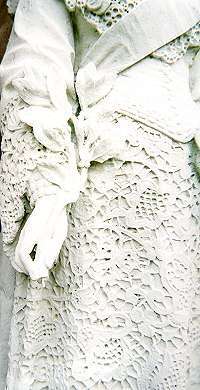 She wears the dress which clearly inspired the one in the Cassidy statue. She wears the saxon blue sash of the Order of the Garter. This work should not be confused with the larger (11 feet high) and better-known statue outside Belfast City Hall. Executed in Sicilian marble, it was unveiled by King Edward VII on 27 July 1903. 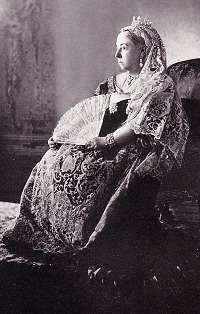 The queen is shown in a similar pose to Cassidy's, but carrying both Royal symbols, the Orb and the Sceptre. It is accompanied by two life-size bronze figures which represent spinning and shipbuilding respectively; at the rear is a bronze figure of a child, thought to represent education. Brock portrayed the Queen seven times in all, as well as designing the portrait for the 1897 issue of British coins. This statue, dated 1897, has been moved, on two occasions. Since 2003 it has stood, following a high-quality restoration, in Shankill Rest Garden (also known as Shankill Cemetery) Cemetery in Belfast, in a specially-created niche, as shown in the picture above. The Rest Garden is open daily from dawn to dusk. Originally, it stood in a niche in the tower above the central entrance to Queen Victoria Royal Jubilee Schools, Durham Street, Belfast, a building erected in 1896 and named to commemorate the diamond jubilee of Queen Victoria's reign, which began in 1837. The Queen had granted Belfast its city charter in 1887 as part of the commemoration of her Golden Jubilee, and her name appears on various the city landmarks. 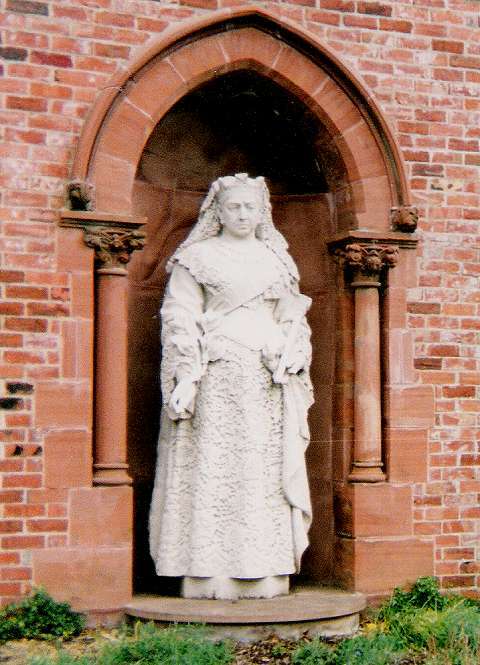 The natural home of a lifesize statue of Queen Victoria is the Shankill Road Graveyard, Belfast City Council has agreed. And Prince Charles will be invited to unveil the refurbished Italian marble likeness of a Royal he admired, deputy Lord Mayor Hugh Smyth said today. Which means that a campaign by Shankill man Albert Boyle to get the City Council to change its mind about putting the statue on a plinth in Botanic Gardens has been successful. Lorry driver Boyle had even written to the Queen about the last resting place of the Royal statue and received an acknowledgment from Buckingham Palace. Now the parks and cemeteries committee at City Hall has granted Mr Boyle's appeal that Victoria should go to the Shankill - backed by Hugh Smyth. The deputy Lord Mayor added: "All parties were agreed that Queen Victoria should be erected in the old Shankill Graveyard. And Prince Charles is the Royal to perform the unveiling. Last time he was here he expressed an interest in the redevelopment of the Shankill. And Queen Victoria was a role model for his grandmother the Queen Mother whom he adored." A row has blown up over a decision to site a life-size statue of Queen Victoria in the Shankill Road Graveyard. A number of south Belfast residents are angry at the decision by Belfast City Council's parks sub-committee because they understood that the statue would be sited in Botanic Gardens. Between 1897 and 1975 the statue stood outside the old Queen Victoria School building, close to the Boyne Bridge and Sandy Row. The school was closed in 1962 and demolished in 1975, when the statue was taken into care. Billy Dickson, a former councillor and community activist in the Donegall Road area, said he had been receiving phone calls about the decision. "The gardens are our nearest recreational area. They have already spent public money building an arbour and plinth to place the statue there," he said. "But during the delay in getting it down there, the decision has been changed." The proposal to move the statue to the Shankill Road graveyard was promoted by lorry driver Albert Boyle. He said that it would be a more suitable home than the "impersonal" Botanic Gardens. He said there had been plans to hold a Victorian Day at the Botanic site for the former pupils of the Queen Victoria School. One of them, Martha Holmes (82), from Donegall Avenue, said she had been looking forward to seeing the statue in Botanic Gardens. "It is disappointing that the decision has been reversed. If it had been moved to the gardens, it would have been somewhere in our area where we could go and see it." Mr Dickson said he had telephoned councillor Margaret Crooks, chairman of the parks sub-committee, asking that the decision be re-considered. "Councillor Crooks seemed very supportive of our views," he said. A special parade and ceremony took place today to celebrate the arrival of an ornate statue of Queen Victoria at Shankill Rest Garden (Shankill Graveyard). 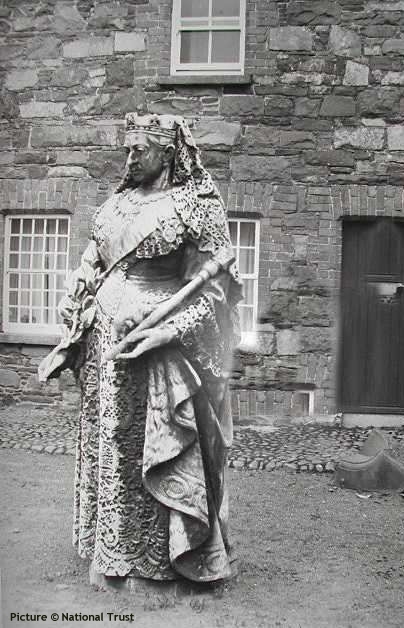 Now, after a 'contest' between Shankill Rest Garden and Botanic Gardens, Queen Victoria's statue is to find a new home among her loyal subjects on the Shankill. Former Belfast Lord Mayor Hugh Smyth (PUP), was instrumental in the campaign to have the statue placed in the cemetery. The eight-foot tall statue was created in the 19th century to commemorate Queen Victoria's Diamond Jubilee. It was sculptured from Portland sandstone by John Cassidy from Drogheda, who trained in Manchester and became one of the foremost sculptors of his generation. His ornate statue ... has now been extensively restored. It was placed on its new plinth during the first week of December and has been a real boost for the Greater Shankill community. The unveiling and re-dedication ceremony was organised by the West Belfast Athletic & Cultural Society. Albert Boyle, a former pupil of Queen Victoria National School, who was also heavily involved in the campaign, organised an exhibition of old photographs of the Grosvenor Road area in St Matthew's church hall, beside the graveyard, which was staged yesterday and today. Since 2003, it appears to have been accepted by all and led a peaceful existence in its garden. As far as we know, no Royal personage was persuaded to unveil it. Updated by Charlie Hulme February 2009. Pictures from the Lis Nicolson collection.